A niece of mine, who lives in Los Angeles, California, attends the LA film festival each year in June. It is a very large event, attended by 90,000 people. 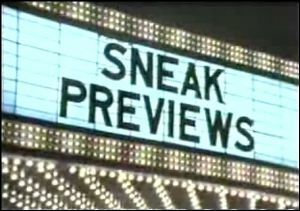 Some of the films shown haven’t appeared in the theaters yet, they are what we call “sneak previews,” or advance showings. I’ve often wondered what it might be like to see a movie in advance of most everyone else seeing it. Then when I went to see the movie with my friends, I would already know the ending. I wonder, would that make the move more enjoyable, or less? “Sneak Previews” is one way to understand this mysterious event reported in today’s Gospel lesson. In advance, before it actually happens, the disciples get a glimpse, a sneak preview, not only of Jesus’ final destiny but also theirs. Imagine for a moment what it would be like if we cheated? What would it be like if we read the last chapter of a murder mystery first and then went back and read the story from the beginning? Because we had a sneak preview of what’s coming, we would know from the very beginning of the story “who dun it.” Then we would experience the plot of the story in an entirely new way. The excitement would come not from the uncertainty of the ending but rather from watching how the story unfolds and leads us to the ending. A similar thing happens to Jesus and his disciples in today’s Gospel. On that mysterious mountaintop they receive from God a sneak preview of the last chapter. Luke has made it clear that Jesus is determined to go to Jerusalem. Jesus knows that He must go to Jerusalem to suffer and die. Such a dire prediction surely must have shaken the disciples. So Jesus takes them up a mountain to pray. They were going to need God’s help for the dangers that lie ahead. That’s important, because after his Baptism, Jesus makes a 40 day journey into the wilderness to be tempted by the Devil. It was those words spoken at his baptism that prepared Jesus to endure all the terrible things that lie ahead. Regardless of the coming trials and temptations, Jesus would always be the beloved Son of God. God gives Jesus that same assurance here on the Mount of the Transfiguration. As Jesus makes his final journey to his death in Jerusalem, God repeats the promise of His Baptism. In spite of the coming betrayal, arrest, ridicule, suffering, crucifixion and death, His heavenly Father would be with him. Jesus would be brutally beaten and crucified. He would die and be buried. And he would be raised again on the third day! These words from the cloud assured Jesus that his fate would never be in question. His faith in his heavenly Father would never be in vain. That faith, based on the sneak preview Jesus received on this mountain top, would enable Jesus to experience the rest of His story in a whole new way. Because He knew what the last chapter would be, He no longer needed to be uncertain or unsure of His destiny. He no longer needed to be afraid of His enemies, or fear losing his life. He was free. He could bear his cross faithfully. Isn’t that also true for us? Isn’t that what happened to us in the waters of our Baptism? Our Baptism may not have exactly the same as Jesus’ baptism. A dove may not have descended from heaven. A voice may not have thundered from the clouds. But God gave us a promise! That’s what’s so powerful about our Baptism. With the water of our baptism, poured on our heads, is the Word of God’s promise. Say this after me: “You are God’s child, chosen and loved.” That’s the promise God makes in your baptism. “You are God’s child, chosen and loved. Now, please turn to the person on your right, and on your left, the person in front of you and behind you, and say these words, “You are God’s child, chosen and loved.” Go ahead and do that now. In our baptism, God announces that, in spite of a future filled with questions and uncertainties, in spite of the suffering, betrayal and disappointment we might have to endure in this life, we are still God’s beloved and chosen children. And nothing or no one can ever take that promise away from us. Our Baptism promises that Jesus’ last chapter would also be ours. We have an Easter resurrection in our future, not because our deserving, but because of God’s promise. We know what the last chapter will be before it has ever happened. And that changes everything. We can live the remaining plot of our story differently. The season of Lent begins this week. One of the faith practices that have long shaped the life of the church during the 40 days of Lent is “giving up something for Lent.” Unfortunately, the church has often misused this spiritual practice by making it a matter of obligation, one more thing we have to do, one more burden to bear. But what if giving up something for Lent is something that we really want to do? What if it becomes a way of expressing our freedom and confidence in the promises of God? What if it could be a way to express our faith in the sneak preview God has already given us? What if we decided to do with less, or do without, or decided to take on some intentional action of serving others, or giving to others, not because we have to but because we want to? What if we wanted to show that the things of this world don’t matter when compared to what God has given us in Christ? In our busy lives, one of the most precious commodities we have is our time. Our world warns us not to waste it. We are told time is short. But, what if we lived with the promise of our faith, that time is not running out? What if we knew that, even when we breathe our last, there is still more? What if we knew that the last chapter of our life is only the next chapter of our life in eternity with Christ? Then we would be free to use our time in ways that are not just about adding to our bottom line. We could take time to deepen our knowledge of Christ and strengthen our relationship with him. We could live more fully into our calling as servants of God, followers of Jesus, members of his body, participants in his mission. As the church we get to live differently. We know that God has chosen us, calls us to his purposes, and names us his beloved children, regardless of what our neighbors, our friends or the boss say about us. Even though our futures might seem cloudy and uncertain, we have been the mountain top. We have seen the sneak preview. And no one, and nothing can take that from us! Thank you for another good sermon. Thought you would like to know,,,,,Sharon Carlson’s funeral is today.